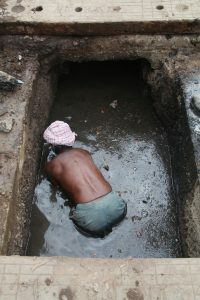 Manual scavenging is one of the most dehumanising occupations in India. Photo courtesy Divya Bharathi. 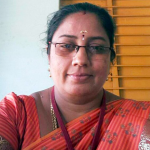 Activist and filmmaker Divya Bharathi has applied for anticipatory bail after 15 cops burst into her house in TN. All of this has been happening before the release of her documentary film ‘Orutharum Varele’ (Nobody came) which looks at government inaction and the struggle of fish workers families and the fishing communities after the Ockhi disaster hit the coasts of Tamil Nadu and Kerala. 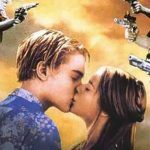 Here’s a piece on her previous movie Kakkoos. Our apathy towards manual scavenging has crossed the threshold from worrisome to dangerous. 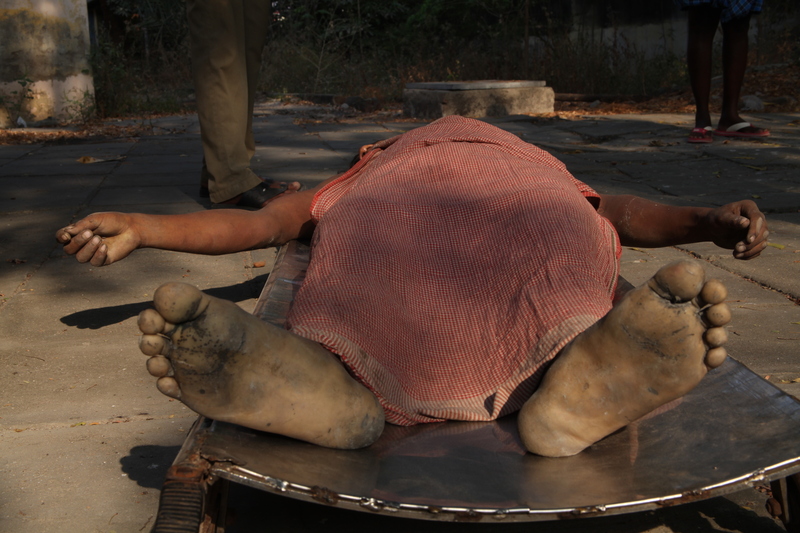 Since 2008, there have been 60 manual scavenger deaths in Karnataka. Last week, three migrant workers died in Bangalore while cleaning a sewer. And just two days back, a Karnataka minister called for legalising manual scavenging in the case of “emergency situations.” Social Welfare Minister H Anjaneya said that his department planned to introduce a legislation to allow manual scavenging, despite the SC’s recent ruling against the practice. How are we okay with this happening? Manual scavenging is one of the most dehumanising and dangerous occupations and India has had a tumultuous (and ongoing) history with it. In spite of The Employment of Manual Scavenging and Construction of Dry Latrines (Prohibition) Act,1993, this practice is rampant across the country. Even as The Prohibition of Employment of Manual Scavengers and their Rehabilitation Act was passed in 2013 and with Prime Minister Narendra Modi’s promise of abolishing it by 2019—nothing has changed in four years. Mainstream media still continues to report deaths of manual scavengers almost every day and those of us who read it find that our eyes just glaze over this news. What does it say about us as a society that we are okay with this happening; that we are perfectly comfortable in exploiting these people into serving us this way? I reached out to Janaagraha Centre for Citizenship and Democracy, a Bangalore-based NGO that seeks to improve the quality of life in urban India “through systemic change,” regarding Minister Anjaneya’s statement. 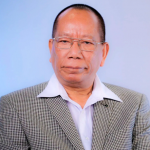 While they refused to comment on the minister’s specific statement, Anil Nair, the deputy head for advocacy, said that this was an example of not adequately investing in technical and financial resources. “It is a clear question of priority,” Nair says, adding that governments prefer spending a lot of money on projects that are “more visible” (roads, flyovers), rather than investing in salaries of people who matter. From the conversation, it was clear that not only were people’s salaries neglected but people themselves were neglected. This is where Kakkoos comes in—the documentary provides a scathing insight into what manual scavengers go through every day: there are defiled toilets overflowing with human excrement, urinals clogged with faeces, men in drains clearing out excessive sewage—all with their bare hands. For the film Kakkoos, filmmaker-activist (as she likes to be known) Divya Bharathi travelled to 25 cities in 20 districts in Tamil Nadu to find manual scavengers and talk to them. The 26-year-old walked a minimum of 20 km in each city to locate even just one or two. Not because they didn’t exist but because residents weren’t aware of where to find one manual scavenger, let alone a group; no one knew when they would start or finish work. “After reaching a city by bus, I roamed the streets until I could spot one of them. 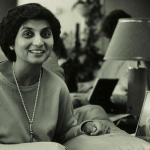 I would wait outside public restrooms, garbage bins for hours…” It was only later that she learnt that their day can start at 6 am and go on till 11.30 am when the sun slowly reaches its peak. The blazing afternoon shift lasts from 1.30 pm to 4.30 pm or ‘uchi veyyil’ and the late night shift from 10 pm to 3 am, where women make up the maximum number. It’s tough to pick one difficult scene in Kakkoos because they’re all equally heart-wrenching and harrowing. But the one where an old man cries about having to do this work should be enough to pierce our collective apathy and wildly oppose anyone like H Anjaneya who wants to legalise manual scavenging. “I’m also a human being; think about me as well. I haven’t been paid, I haven’t been able to buy my children clothes to wear,” he cries before sweeping faeces from the corner of a bathroom, scooping it up with his hands and disposing it into the garbage box. 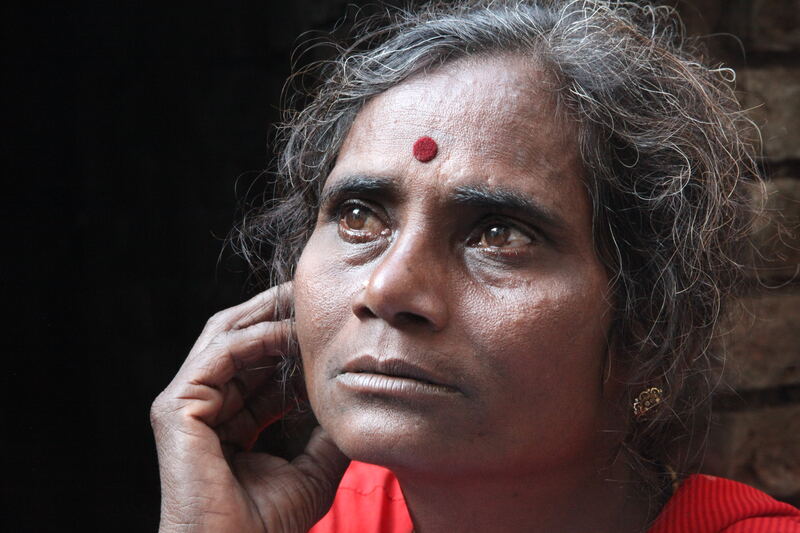 In the one year of filming, Divya says she documented 27 manual scavenger deaths. He has a point: How many of us have noticed a man entering a drain on the street, completely naked except for a piece of cloth around his waist? How many of us have instead covered our faces because we were unable to stomach the stench that is a part of their lives? Why don’t we call the police or the contractors or the RWAs who allow this instead? As Kiran Prakash asks in this piece, why isn’t there a drive to end ill-treatment of sanitation workers? As per the 2011 Socio Economic and Caste Census, 1,82,505 households in rural areas reported as manual scavengers; of this, the south zone has 16,362 manual scavengers. Compare this with the same government-based survey done in 2015 as per the MS Act 2013 that called for a list to identify and rehabilitate manual scavengers: the number is shockingly low—12,226—lost in translation, perhaps? The same census data notes the number of dry latrines at 7,94,390 where human waste is cleaned manually. This UN report says that Andhra Pradesh, Assam, Jammu and Kashmir, Maharashtra, Tamil Nadu, Uttar Pradesh and West Bengal account for more than 72 percent of the insanitary latrines. Who are the men and women who undertake these ‘jobs’? 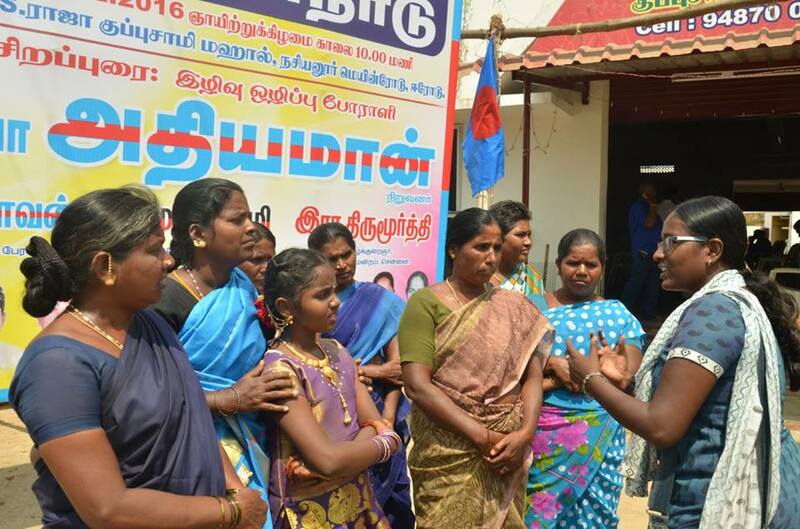 Divya, a CPI(ML) activist since class XI, who is from Aruppukottai in Virudhunagar district, during the course of filming found that it wasn’t just the Arunthathiyars of the Dalits who are forced to do manual scavenging but that the workers vary according to the district and the city. “The majority are SC/STs: Arunthathiyars, Paraiyars, Pallars, Kallars…” she trails off. The workers are hired through private contractors who send them on contracts to clean. 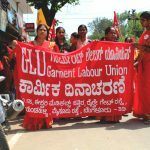 Apart from their day jobs, these workers also go to private residences on call to clean—“the government has privatised this business,” Divya says. The contract companies pay different wages to their employees. 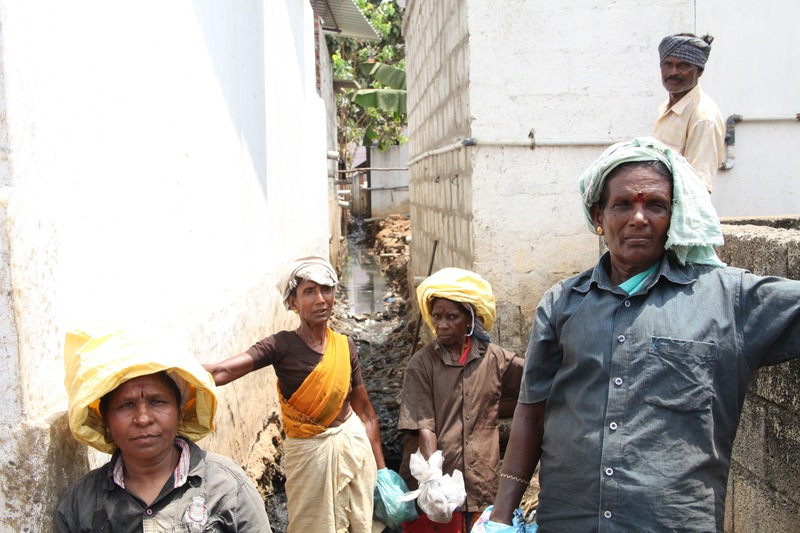 Men in manual scavenging are usually lorry drivers and clean out septic tanks and drains, while the women are sweepers who collect garbage and push carts. And as with every ‘job’, manual scavenging too sees a gender disparity. Women here are economically and sexually exploited, says Divya, and are made to work the night shift. “Unlike the men who are likely to wander out [at night], the women are considered more ‘responsible’. And unlike the men, women don’t usually wander out at night alone, but will work as groups,” she says. What is the point of feminism if we don’t talk about these women? Photo courtesy Divya Bharathi. The women have to also contend with sexual harassment from supervisors, sanitary inspectors, conservancy officers, contractors, but they have no option but to work. “What is the point of feminism if we aren’t talking about these women? Why are we excluding them from our collective consciousness,” asks Divya. Even their demands are different: men want their jobs to be made permanent and want more money, but the women just don’t want to clean with acid since it gives them urinary infections and even affects their uteruses. Neither party can afford giving up the job though. Bindeshwar Pathak, a sociologist, who founded Sulabh International, an organisation that promotes human rights and environmental sanitation, is of the opinion that these workers should not be discriminated against. “They should be insured, given a higher salary, given all equipments to protect themselves and more importantly, treated better. This way, anybody can undertake this. In some cases, technology can’t help, like those bedridden in hospitals who have to use bed pans. Someone will have to clean it; you can’t use technology for things like this,” he says. Even as Pathak lays out his reasons, it’s this kind of attitude that renders these workers invisible, not just because they have no other employment options, but because this practice is humiliating and degrading and should rightfully be considered so. Increasing their wages is not a long-term solution. Throughout the process of her filmmaking, Divya was clear about one thing: that she would highlight the plight of manual scavengers only through their eyes and their work. “I didn’t include officials or residents because I didn’t want to waste time showing them.” But she did talk to some of them. “In Tirunelveli, in my two days of shooting I saw 500 manual scavengers at least. I spoke to a sanitation inspector there who told me ‘we have no manual scavengers’,” she says dryly. This was the same attitude of the IGNCA, which steadfastly refused to accept that three of the four Dalit men they sent in to unblock a drain sewer—they died on being instantly hit by methane—were their employees. Moreover, the administrative and engineering department officials failed to accept that they did not follow safety requirements. The Karnataka minister is no different than the aforementioned examples when he proposed a solution as absurd as legalising manual scavenging, that too quoting the proposal only for emergency situations where men can enter only if they are given adequate protection—that “men are required to enter manholes when there is absolutely no choice.” How about providing a choice, Mr Minister, between dignity and death? Thank you for this. This is powerful and hard-hitting. Living in our bubbles of comfort we’ve become blind to this open abuse because we benefit from it. Part of the problem is that the hindutva government is too busy trying to erase the caste system from textbooks and history. 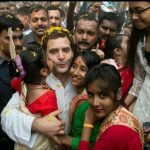 Waves of doctored whatsapp messages are bombarding Indians and NRIs that caste system is just or harmless, or that we are all shudra when we clean and brahmin when we teach, or that Muslims enforced caste system on India. Here in California a powerful hindu right advocacy group sued the state’s education board to delete mention of caste system from a social science textbook. Thank god, they lost. The problem persists because of the culturally-sanctioned invisibility. You’re right that we associate sanitation workers with an oppressive odor and tend to look or walk away. This makes it easier to forget—out of sight, out of mind. I remember Satyamev Jayate did an episode on this human rights abuse. It’s degrading and dehumanizing. It’s good that so many journalists and activists are shining a spotlight on the issue. We must feel guilty and ashamed. We benefit from the abuse of so many. Hello, where can I watch this?